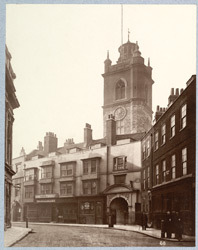 "The photograph shows the tower of the Church, the body of which, on the side of the street, is masked by picturesque houses. The Church contains a modern bust of Milton, who was buried here. In the churchyard, at one time, as may be seen by Archer's Vestiges, very picturesque, but now spoilt by the erection around it of great warehouses, is a bastion, one of the few remaining fragments of London Wall." It was reduced to ruins during an air raid in World War II and later rebuilt by Godfrey Allen as the parish church of the Barbican development.